During the 2011 fiscal year, state-local tax burdens as a share of state incomes decreased on average. This trend was largely driven by the growth of income in all states. In 2011, the residents of New York, New Jersey, and Connecticut had the highest state-local tax burdens as a share of income in the nation. In these states, residents have forgone over 11.9 percent of income due to state and local taxes. Residents of Wyoming paid the lowest percentage of income in 2011 at just 6.9 percent. They replaced Alaska, which had previously been the least-taxed for multiple decades, as the lowest-burdened state in the nation. After Wyoming and Alaska, the next lowest-taxed states were South Dakota, Texas, and Louisiana. State-local tax burdens are very close to one another and slight changes in taxes or income can translate to seemingly dramatic shifts in rank. For example, the twenty mid-ranked states, ranging from Oregon (16th) to Georgia (35th), only differ in burden by just over one percentage point. On average, taxpayers pay more to their own state and local governments (73 percent of total burden). Taxes paid within states of residence decreased on average in 2011, while taxes paid to other states increased, leading to a slight decrease in total burden. Some states deviated from these national trends, however. For nearly two decades, the Tax Foundation has published an estimate of the combined state and local tax burden shouldered by the residents of each of the fifty states, regardless of the jurisdictions to which those taxes are paid. We argue that it is important to note that a taxpayer’s true tax burden must include the substantial taxes they pay directly or indirectly to out-of-state governments. When organizations analyzing federal tax burdens, such as the Congressional Budget Office or the Urban-Brookings Tax Policy Center, measure tax burdens by income group, they go beyond measuring the legal incidence of a tax (who writes the check to the government) and account for the fact that taxes legally imposed on a given person in one income group (such as employers via the payroll tax) can be shifted to a different person in another income group (like employees). Similarly, our state and local tax burden estimates account for the shifting of taxes from one group to another under a different variable by which household are organized: state of residence rather than income level. For each state, we compute this measure of tax burden by totaling the amount of state and local taxes paid by state residents to both their own and other governments and then divide these totals by each state’s total income. We not only make this calculation for the most recent year, but also for earlier years due to the fact that income and tax revenue data are periodically revised by government agencies. In this annual study, our goal is to move the focus from the tax collector (how much revenue is collected) to the taxpayer (how much income is foregone). We aim to find what percentage of state income residents are paying in state and local taxes and whether those taxes are paid to their state of residence or to others. This study is not an attempt to tally the amount of money state and local governments have collected and these tax burden estimates will thus not mirror Census Bureau state and local tax collection data (the definitive source on this topic). When answering the question of which state’s residents pay the most in state and local taxes, it should be clear that such tax burden measures are not measures of the size of government in a state, nor are they technically measures of the complete burden of taxation faced by a given state’s residents (this study excludes compliance costs and economic efficiency losses). Furthermore, the tax burden estimates presented here do not take into account the return to that taxation in the form of government spending. These drawbacks, however, are not unique to our tax burden estimate. The state and local tax burden estimates for FY 2011 presented in this paper use the most recent data available as of January 2014 from the Census Bureau, the Bureau of Economic Analysis, and all other data sources employed. For a full list of data sources, in addition to an overview of the methodology used to arrive at these estimates, please see Tax Foundation Working Paper 10. State-local tax burdens of each of the fifty states’ residents as a share of income are clustered quite close to one another. This is logical considering state and local governments fund similar activities such as public education, transportation, prison systems, and health programs, often under the same federal mandates. Furthermore, tax competition between states can often make dramatic differences in the level of taxation between similar, nearby states unsustainable in the long run. Therefore, it is not surprising that state-local tax burdens as a share of income are very close to one another, and slight changes in taxes or income can translate to seemingly dramatic shifts in rank. For example, the twenty mid-ranked states, ranging from Oregon (16th) to Georgia (35th), only differ in burden by just over 1 percentage point. However, while burdens are tightly clustered in the center of the distribution, states at the top or bottom can have substantially higher or lower burdens. Nationwide, over a quarter of all state and local taxes are collected from nonresidents. As a result, the residents of all states pay surprisingly high shares of their total tax burdens to out-of-state governments. Table 1 lists the per capita dollar amounts of total tax burden and income that are divided to compute each state’s burden in rank order as well as the breakdown of in-state and out-of-state payments for FY 2011. Notes: As a unique state-local entity, DC is not included in rankings, but the figure in parentheses shows where it would rank. Source: Tax Foundation calculations. Please see methodology paper for more information on all data sources and complete methodology. In 2011, state incomes on average rose in real terms after a decrease in 2008, 2009, and 2010. This translated to lower tax burdens as a share of state incomes when compared to 2010. 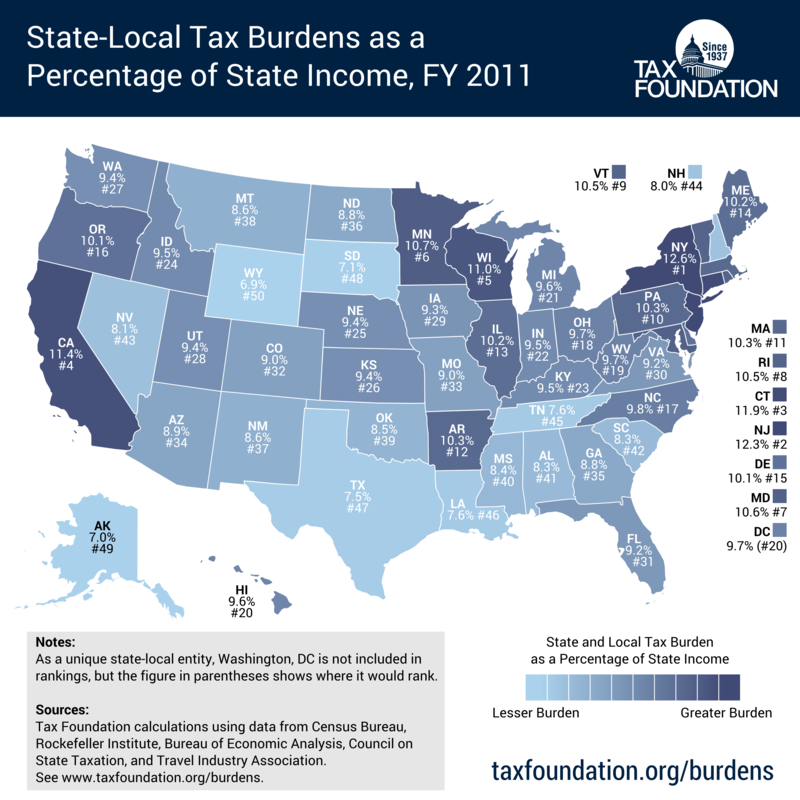 The residents of three states stand above the rest, experiencing the highest state-local tax burdens in the country: New York, New Jersey, and Connecticut. These are the only states where taxpayers forego over 11.9 percent of their income in state-local taxes, one half of a percentage point above the next highest state, California. New York, New Jersey, and Connecticut have occupied the top three spots on the list since 2005. This may be partially attributed to high levels of expenditures which must be sustained by high levels of revenue. Further, in the case of Connecticut and New Jersey, relatively high tax payments to out-of-state governments add to already high in-state payments. This is likely related to the fact that these are high income states that pay high levels of capital gains. High levels of capital gains will result in residents paying an increased share of other states’ business taxes. New York residents experienced the highest burden at 12.6 percent of income. Next were New Jersey and Connecticut, where residents paid 12.3 and 11.9 percent, respectively. Rounding out the top ten in highest state-local burdens are California, Wisconsin, Minnesota, Maryland, Rhode Island, Vermont, and Pennsylvania. Residents of Wyoming paid the lowest percentage of income in 2011 at just 6.9 percent. Wyoming replaced Alaska, which had previously been the least-taxed for multiple decades, as the least-burdened state in the nation. Rounding out the bottom ten were Alaska, South Dakota, Texas, Louisiana, Tennessee, New Hampshire, Nevada, South Carolina, and Alabama. Residents of these states paid between 7.0 percent and 8.3 percent of income in state and local taxes. Since 2000, state-local tax burdens as a share of income have grown slightly from 9.5 percent to 9.8 percent in 2011. During that period, however, there has been some slight fluctuation. From 2005 to 2010, burden as a share of income slowly increased, hitting a high of 10.2 percent in 2010 and dropping to 9.8 percent in 2011. Generally, there are three reasons why a state’s ranking could change from year to year. First, there could have been a change in total collections by the state, either due to policy changes or economic fluctuations. Second, there may have been a change in the level of state income as a result of the economy. And third, other states to which residents pay state and local taxes could have seen changes in tax collections (again due to changing policy or economic conditions). The most pronounced changes in burdens between 2010 and 2011 occurred in Wyoming (decrease of 1.1 percentage points), Hawaii (decrease of 0.8 percentage points), and South Dakota (decrease of 0.8 percentage points). Wyoming’s relatively large decrease moved it down the rankings list, from 46th in 2010 to last place in 2011. Hawaii moved from 14th to 20th, but South Dakota’s burden barely changed (from 49th in 2010 to 48th in 2011). The largest movement in rank occurred in Delaware. The state had a ranking of 30th in 2010 but moved up to 15th in 2011. Only two states (Delaware and Maryland) and Washington, DC saw an increase in residents’ burdens as a share of income. Delaware’s burden increased from 9.5 percent in 2010 to 10.1 percent in 2011. Maryland’s burden only increased by 0.1 percentage points, from 10.5 percent in 2010 to 10.6 percent in 2011. Washington, DC’s burden increased from 9.2 percent in 2010 to 9.7 percent in 2011. Table 2 lists the burden as a share of income and ranks for each of the fifty states and Washington, DC for the last three fiscal years. Notes: As a unique state-local entity, DC is not included in rankings, but the figure in parentheses shows where it would rank. DC is included in U.S. population-weighted averages. Source: Tax Foundation calculations. Please see Appendices A and B for more information on all data sources and methodology. An interesting observation is that many of the least-burdened states do without a major tax. For example, Alaska (49th), Nevada (43rd), South Dakota (48th), Texas (47th), and Wyoming (50th) all do without a tax on wage income. Similarly, Nevada, South Dakota, and Wyoming all lack a corporate income tax, and Alaska has no state-level sales tax (though it does allow local governments to levy sales taxes). While this is an interesting correlation, it does not answer the question of whether levying fewer types of taxes leads to lower tax burdens or whether a political demand for lower taxes leads to fewer types of taxes being levied. Also worth considering is the possibility that opting to not levy a personal income tax causes a state to rely more on other forms of taxation that might be more exportable. Not every state with a significant amount of nonresident income uses it to lighten the tax load of its own residents. Maine and Vermont have the largest shares of vacation homes in the country, and they collect a sizeable fraction of their property tax revenue on those properties, mostly from residents of Connecticut, Massachusetts, and other New England states. Despite this, Maine and Vermont still rank 14th and 9th highest, respectively, in this study. Sales tax in the District of Columbia is another example—a significant portion is paid by residents of Virginia and Maryland who work within Washington, DC and pay the city’s sales and meals taxes; however, DC still has a relatively high burden (9.7 percent of income). This study is not an endorsement of policies that attempt to export tax burdens. From the perspectives of the economy and political efficiency, states can create myriad problems when they purposefully shift tax burdens to residents of other jurisdictions. This study only attempts to quantify the amount of shifting that occurs and understand how it affects the distribution of state and local tax burdens across states. Despite the importance of nonresident collections and the increasing efforts to boost them, the driving force behind a state’s long-term rise or fall in the tax burden rankings is usually internal and most often a result of deliberate policy choices regarding tax and spending levels or changes in state income levels. The difference between tax burdens and tax collections is best explained by differentiating between what is known as the “legal incidence” of a tax versus the “economic incidence” of a tax. “Economic incidence” simply means the ultimate bearer of the monetary burden of a tax. Whose income is ultimately reduced as a result of the tax? This person bears the economic incidence. For example, businesses bear the legal incidence of business taxes (that is, they write the check to the government), but the ultimate economic burden of the tax is passed on to consumers in the form of higher prices, to employees in the form of lower wages, and to shareholders in the form of lower returns. Further, those bearing the burden of business taxes may sometimes be nonresidents. While tax collection figures are useful for some purposes and are cited frequently, dividing total taxes collected by governments in a state by the state’s total income is not a measure of the average effective tax rate imposed on that state’s residents as a whole. Such a statistic is almost useless from a traditional tax burden perspective, because for a given state’s income level, the tax collections figure used to calculate (incorrectly) the average effective tax rate (taxes divided by income) does not reflect the taxes that are actually paid out of that given income. In many cases, a sizeable fraction of those who bear the burden of state and local taxes are not residents because the state is able to shift significant portions of their tax burdens to out-of-state individuals. Alaska provides the best example. In 2011, the state was able to export nearly 80 percent of its tax collections to residents of other states. If Alaska’s tax collections are compared directly to Alaskans’ income, the burden appears much higher than in many other states. This is not an accurate measure of the true tax burden faced by Alaskan taxpayers. Alaskans pay no state-level tax on income and face no state-level sales tax (though there is a local option sales tax with rates that can range from 0 to 7.5 percent). However, Alaska does have a special, prodigious source of revenue: severance taxes on oil extraction. In fact, Alaska derives 77 percent of its tax collections from severance taxes, and residents actually receive checks from a reserve fund containing billions of dollars of oil tax revenue. The burden of these Alaskan oil taxes does not fall predominantly on Alaska residents. This study assumes that much of the economic burden of these taxes falls not on Alaskans but rather on consumers of oil and oil-based products across the country in the form of higher prices. Therefore, to correctly portray how low Alaskan residents’ tax burden is, we allocate Alaska’s oil severance tax to other U.S. states based on oil and gas consumption. Once this allocation is made, Alaskans’ tax burden falls from among the nation’s highest to the lowest. Taxes levied on mineral extraction in other states have similar but less dramatic effects. Resource-rich states, such as Alaska and Wyoming, are only the most extreme examples of tax exporting. Major tourist destinations like Nevada and Florida are able to lower their residents’ burden by taxing tourists who are most often nonresidents. Some states have large numbers of residents employed out of state who pay individual income taxes to the states where they work. When a metropolitan area attracts workers from nearby states, a large portion of wage income in a state can be earned by border-crossing commuters. On the other hand, some states have reciprocity agreements in which they tax their own residents regardless of where they work (this study accounts for these agreements). When Connecticut residents work in New York City and pay income tax to both the state and the city, the Census Bureau will count those amounts as New York tax collections, but we count them as part of the tax burden of Connecticut’s residents. In addition to allocating the taxes cited above, this study also allocates taxes on corporate income, commercial and residential property, tourism, and nonresident personal income away from the state of collection to the state of the taxpayers’ residences. For a full list of incidence assumptions employed in this model and methods used to allocate tax revenues to other states, see our methodology paper. Every state’s economic activity is different, as is every state’s tax code. As a result, each varies in their ability to export their tax burden. Economists have been studying this phenomenon since at least the 1960s when Charles McLure estimated that states were extracting between 15 and 35 percent of their tax revenue from nonresidents. Many states, however, make a conscious effort to levy taxes specifically on nonresidents, and that effort seems to be accelerating. In fact, many campaigns for tax-raising legislation in the last several years have explicitly advertised the ability to push the burden of a certain tax onto non-voting, nonresident payers as a reason for resident voters to accept the tax. This beggar-thy-neighbor effort has been mostly legislative, exemplified by a wave of tax hikes on tourism: hotel rooms, rental cars, restaurant meals, and local sales taxes in resort areas. States and localities have also targeted nonresidents with higher property taxes and, in rare cases, higher income taxes. Nationally, average state-local tax burdens as a share of income have fallen from 10.5 percent to 9.8 percent since 1977. Burdens, on average, rose from 2000 to 2010, followed by a decrease in 2011. Some states’ taxpayers are paying the same share of their income now as they were three decades ago, but some have paid steadily more and others less. The tax burden in every state changes as years pass for a variety of reasons, including changes in tax law, state economies, and population. Further, changes outside of the state can impact tax burdens. See Table 3 for historical trends in burdens by state. Once again, Alaska is the extreme example. Before the Trans-Alaska Pipeline system was finished in 1977, taxpayers in Alaska paid 11.0 percent of their income in state and local taxes. By 1980, with oil tax revenue pouring in, Alaska repealed its personal income tax and started sending out checks to residents instead. The tax burden plummeted, and now Alaskans are one of the least taxed with a burden of only 7.0 percent of income. Other states that have seen significant decreases in burdens are described below. North Dakota’s burden has fallen from 11.8 percent to 8.8 percent of income. Its burden was even lower in 2005 at 8.6 percent, but it now ranks 36th. South Dakota’s burden has fallen 2.3 percentage points since 1977, when it was 9.3 percent. It is now 7.1 percent and ranked 48th. Massachusetts has experienced a burden decrease of 2 percentage points since 1977, when its burden was 12.3 percent of income. In 2011, the burden dropped to 10.3 percent with a ranking of 11th. Indiana taxpayers have seen their burden rise from 8.6 percent to 9.5 percent since 1977, and their state now ranks 22nd. Connecticut taxpayers’ burden has risen 0.8 percentage points from 11.1 percent in 1977 to 11.9 percent in 2011, putting the state in third place. Ohio’s burden has risen from 9.0 percent in 1977 to 9.7 percent in 2011. It now ranks 18th. When measuring the burden imposed on a given state’s residents by all state and local taxes, one cannot merely look to collections figures for the governments located within state borders. There is a significant amount of tax shifting across state lines, and this shifting is not uniform. Further, this shifting should not be ignored when attempting to understand the burden faced by taxpayers within a state. See, e.g., Congressional Budget Office, Effective Federal Tax Rates under Current Law, 2001 to 2014 (Aug. 2004), http://www.cbo.gov/sites/default/files/cbofiles/ftpdocs/57xx/doc5746/08-13-effectivefedtaxrates.pdf. See, e.g., Rachel M. Johnson & Jeffrey Rohaly, The Distribution of Federal Tax Rates 2009-12, Urban-Brookings Tax Policy Center (Aug. 2009), http://www.urban.org/uploadedpdf/411943_distribution_federal.pdf. The U.S. Census Bureau’s Government Finance Division encompasses four separate data sources: State Government Finances (http://www.census.gov/govs/state/); State Government Tax Collections (http://www.census.gov/govs/statetax/); State & Local Government Finance (https://www.census.gov/govs/local/); and Quarterly Summary of State & Local Taxes (http://www.census.gov/govs/qtax/). Elizabeth Malm & Gerald Prante, Tax Foundation State-Local Tax Burden Estimates: An Overview of Methodology, Tax Foundation Working Paper No. 10 (Apr. 2014, ), http://www.taxfoundation.org/burdensmethodology [hereinafter Working Paper No. 10]. Business taxes collected by states are allocated nationwide based on each state’s share of capital and labor income. States with high capital gains tax rates will have larger capital income relative to other states. The average local sales tax rate in Alaska is 1.69 percent. See Scott Drenkard, State and Local Sales Tax Rates in 2014, Tax Foundation Fiscal Fact No. 420 (Mar. 18, 2014), https://taxfoundation.org/article/state-and-local-sales-tax-rates-2014. See U.S. Census Bureau, Historical Census of Housing Tables: Vacation Homes, Census of Housing, http://www.census.gov/hhes/www/housing/census/historic/vacation.html. For a full discussion of methodology and all incidence assumptions, see Working Paper No. 10, supra note 4. Severance taxes are taxes on the removal of natural resources. For severance tax collections by state, see U.S. Census Bureau, 2011 Annual Survey of State Government Tax Collections, http://www.census.gov/govs/statetax/historical_data_2011.html. Residents of Alaska receive checks each year from the state’s Permanent Fund. See Alaska Department of Revenue, Permanent Fund Dividend Division, Eligibility Requirements, http://pfd.alaska.gov/Eligibility/EligibilityRequirements. Maine and Vermont, due to the large number of homes that are vacation residences in the two states, are able to export a large fraction of their property taxes to other states, mostly other New England states such as Connecticut and Massachusetts. See Working Paper No. 10, supra note 4. Charles E. McLure, Jr, The Interstate Exporting of State and Local Taxes: Estimates for 1962, 20 National Tax Journal 49-75 (1967). One recent example was Minnesota Governor Mark Dayton’s attempt to raise income taxes on “snowbirds,” those individuals who only reside in Minnesota for a portion of the year, in 2013. A full list of the historical state-local tax burdens for each year from 1977 to 2011 is available on the Tax Foundation’s website at www.taxfoundation.org/burdens.